A big old trunk. What's inside? Let's open it and see! Two top hats, a wind machine, a fishing rod, a watering can, there's a tree … and a …but what's that in that little box? Look! Two small teddy-bear glove-puppets and a book. Aha! The trunk is a theatre! Let's make a play. You read the book and I'll work a Teddy. You can start reading now. Hold onto your hat because now we're off on an exciting voyage across the stormy sea! One fine morning the hat beaches on a desert island. Teddy makes his home there and one day a tree starts to grow, which he waters and cares for… the book ends here … but there's another Teddy too. And the puppeteers, who don't always see eye to eye, are obliged to make up the rest of the story themselves. Suddenly Teddy isn't alone on his island any more. The other Teddy arrives, plus another hat and … a monster! … or is it just the puppeteer's black glove? And then … well naturally the play has a happy ending, for both teddy-bears and puppeteers. And the monster is returned to its place in the trunk. And blew the hat out on the tide. And blew the hat from side to side. A few queries remain to be answered. How on earth could the puppets just vanish under the puppeteers' coats? How could the puppets eat Cissi's apples? And can puppets really talk? Puppets and set were designed and constructed by Anders Lindholm and Cecilia Billing, who who also wrote the script and work the puppets. Thanks to Juan Rodriguez for dramaturgy advices. Music by: Bleckhornen Academy Brass Band, Jussi Björling, Giuseppe Verdi and others. Real live people whose skilful actions provide nourishment for the children's imagination, stimulates their dreams and tickles excitingly. It's probably these ingredients which make a visit by Dockteaterverkstan so appreciated. This week they visited a couple of schools in Tomelilla. YA joined them in Smedstorp where day-nursery children and child-minders' children gathered in the school basement. The two actors introduced themselves as Anders and Cissi. Half in darkness the performance begins. "Once upon a time there was a trunk," reads Anders slowly and quietly, inviting the children to take part in an exciting "journey" right from the start. The tall trunk in the middle of the stage is full of stuff. There's a wind-machine, a mill for freshly ground dreams and masses of exciting clothes. Soft yet distinct music such as "The Carnival in Venice" accentuates the excitement. And the children, about 50 in Smedstorp, are willingly swept along.TV, videos, films and other things - real, live people of flesh and blood thankfully still keep a steady hold on us all. Elegant in top hat with glace gloves on his hands, Anders gives us a taste of the world. The first puppet to come wandering along the edge of the trunk in a very natural way in the glare of the spotlights is a wonderful teddy bear. And the teddy tells Cissi exciting, extraordinary things. But Anders sneers and ridicules. "Puppets can't tell anything," he scoffs. But Cissi gives him the ancient, heartfelt reply of all dreamers, poets and visionaries: "And what do you know about that?" The journey continues at a dizzying yet pleasant speed in the world where the wind blows in all the storms in the sky. 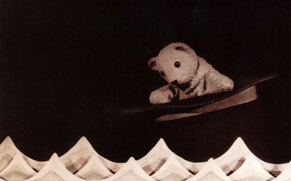 A scenography of very high quality, not to mention the teddy's "choreography", impresses the spectators. For a full three-quarters of an hour we are offered a good "old-fashioned" mixture of excitement, humour, friendship, jubilation and really nice shudders. And while the moon looks down at the hat where teddy has crept in and is sleeping soundly, and while the hat is flying away like an aeroplane and a new teddy appears on the scene to water the trees and bushes - and sometimes Anders too - we see many preschool children assimilate the most important quality for the future: the ability to dream and the courage to use their imagination. Nice work, Dockteaterverkstan. Teddy is sitting in the hat, bobbing wildly in deep water. The children from Navestad's preschools are enraptured by the adventure which ends on a tiny island, ten paces long. Teddy tries fishing and catches one. He lives in his big hat and he waters bushes and trees. Teddy makes an enemy who becomes a friend and then the game moves on of course, changing speed and taking new turns. Dockteaterverkstan from Osby performed 'o'oHold onto your Hat" yesterday, a show for teddies and people. The actors Cecilia Billing and Anders Lindholm make skilful use of a simple story about the adventures ofateddy bear to show the close relationship between play and theatre. The scenography has two colours; white drapes with a pale greyish blue hue fixed to a brownish orange frame. In front of this is a big, tall trunk in the same colour. It gives a calm, harmonious, almost everyday atmosphere. And it from this very ordinary day that the action jerkily grows when Anders and Cecilia open the huge trunk and reveal its contents. The theatre's way of portraying character with costume and emotion is made clear pedagogically and with humour. The audience, three, four and five yearolds and adults, keep up with all the twists and turns of the teddies' play. New impulses sparkle, subside and flash again. Just like it can be when two people play. Finally it's time to clear away, say goodbye and go home - to new games. Today there's a family performance at the Library and tomorrow at Folkets Hus in Skarblacka.